Dublin, Guinness, the Storehouse, the Gravity Bar — one leads to another, it seems, and pre-determines many a tourist's trail through the Irish capital. So, let us get the most important question out of the way first: is the Guinness Storehouse really worth a visit? While the Guinness Storehouse has stayed at the top of the list of Irish visitor attractions for what seems like ages, we're of two minds about this very popular "must-see". Because, is it really a must-see? And does it hold up to the hype? Let us find out. Part of the sprawling complex that used to be a humble brewery at St. James's Gate in 1759, the Guinness Storehouse is the public face of the Dublin stout that conquered the world. It is the nearest the general public will ever get to actually visiting the Guinness brewery. And it is a shrine to the beer Arthur Guinness started brewing, as well as an educational glimpse at both the general process of making a few basic ingredients into a nourishing (and intoxicating) drink, and an insight into the history and current state of the brand Guinness. It is a museum, a fan shop, a place of entertainment, and provides one of the best glimpse over Dublin's rooftops. What it is not is a place you casually stroll into. Even the (massive) shop is off-limits unless you pay an entrance fee (which contrasts with the Old Jameson Distillery on the other side of the Liffey). And it certainly is not, though you will often hear this, a place where you get a free pint of Guinness. True, a pint of Guinness is included — but this would already be paid for by your entrance fee. Having said all that ... the Guinness Storehouse doesn't even seem to be that welcoming upon first sight. Visitors go downstairs and find themselves in a darkish holding area, more than likely to join a longish queue of people wanting to pay the entrance fee. And here's our first tip: do prebook a ticket if you can! It'll make your stay in this dungeon much shorter. And it will also save you money, as the internet price is lower than that charged at the gate. 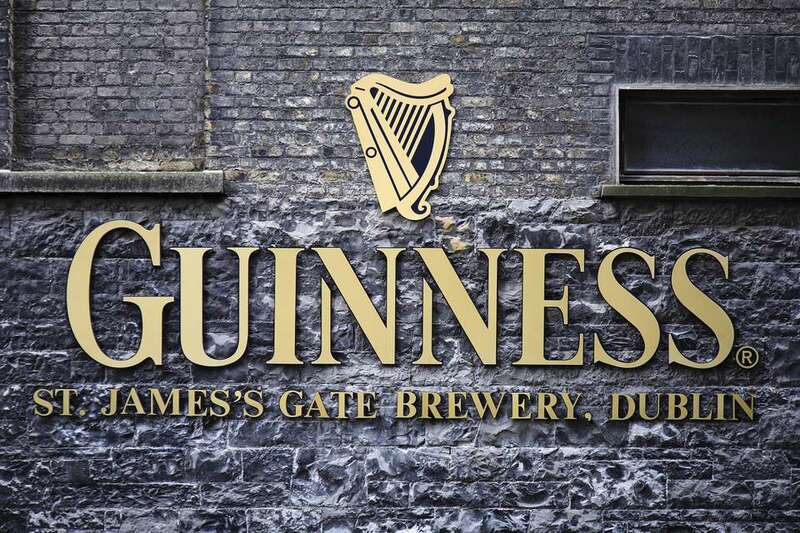 What Will You Experience at the Guinness Storehouse? Upon entering the hallowed halls of the Guinness Storehouse you pick up a free audio guide (if your native language is not English, that is). And you are invited to gaze at a document enshrined in a glass floor — the original lease Arthur Guinness signed for the brewery, the term of which still lasts a few thousand years. Then your gaze is directed upwards, and you find yourself in an architect's attempt to recreate a giant pint-glass of Guinness. And while a retail store is on the left, a visit to this may best be left for last. Ground Floor: The split-level ground floor introduces you to the ingredients used in the brewing process, in a fun way. Especially the indoor waterfall is spectacular (if a little deafening), and the "magical" yeast resides in a safe. You exit the floor through the Arthur Guinness Gallery, which is not as stuffy as it sounds, promised. 1st Floor: The next floor actually takes you through the process of making beer, with the brewing process explained (life-size exhibits help), the cooperage (making of casks) following, and then the transport of the final product rounding it off. Small Guinness locomotives and models of the Guinness ships and barges are part of this - and the aptly named Cooperage Café is ready to nourish you. We actually stopped here for a bite, and can heartily recommend the Guinness bread with brie or, alternatively, salmon. Also don't forget to take in the "Made of More" monument, there's lots of details to discover. 2nd Floor: This floor was, to be honest, a bit of a let-down (apart from a cheeky ostrich many people won't notice, I guess), dedicated to corporate entertainment suites it seems. There is, however, the "Tasting Experience." After queuing a bit you'll be led into a room where the aromas of the ingredients waft about, then handed a miniature glass of the good stuff, and finally introduced to tasting Guinness like a pro. Nice, but not really convincing overall. 3rd Floor: Further up, the real fun (and a slice of reality) starts. The 3rd floor is mostly dedicated to Guinness advertising, with larger-than-life three-dimensional recreations of some iconic adverts, ads on big screens, interactive advertisement archives, a singing oyster, a laser harp you can play (techno-geeks will love this, and some folks actually manage a decent tune). A bit of a contrast is the Drink IQ section, which gently reminds us that not all effects of alcohol are actually beneficial. 4th Floor: One floor up it gets even more hands-on and interactive, if you want to. Here you find the Guinness Academy, where you can learn to pour the perfect pint (and get an official diploma to prove it). Or the Connoisseur Experience, where you can taste varieties of Guinness under the tuition of a master. Or simply drop in at the Infographic Wall, where you can spread the word about your visit on social media. 5th Floor: The 5th floor is dedicated to having a seat and enjoying some nourishment, either in the "traditional Irish pub experience" that Arthur's Bar promises, or in either the Brewer's Dining Hall (self-service, comfort food, relaxed) or 1837 Bar & Brasserie. Is the Guinness Storehouse for Everyone? Honestly, no — it is a fan thing, and an adult thing. We wouldn't recommend it with small children, though teens may well have fun here. If you are not that interested in Guinness, or if you are on a very tight budget, you may want to skip the Storehouse. Seven days a week from 9.30 a.m. to 5 p.m. (last admission). July and August extended hours with last admission is at 6 p.m.
Closed Christmas Eve, Christmas Day, and St. Stephen's Day. General 25 € at the door; From 18.50 € pre-booked on the internet. As is common in the travel industry, the writer was provided with complimentary entry for review purposes. While it has not influenced this review, TripSavvy believes in full disclosure of all potential conflicts of interest. For more information, see our Ethics Policy.